Instead of deciding whether to buy your holster as a belt loop or paddle model, BlackHawk CQC provides you with both platforms for your holster. It gives you the choice of how you want to wear it, since your needs can change from day to day. I love this off duty holster. I have it on my hip right now It works nice, just wish the weapon sat a little deeper in the holster. Great piece of equipment. Gun slips in easily and is well retained. Very satisfied with the prices and availability of your products also quickly shipped. Seems to be a sturdy holster. Went together well, no complaints so far. 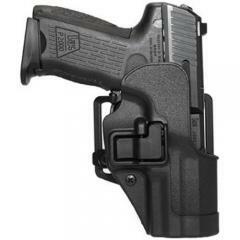 Great holster Very adjustable, comfortable and easy to use. Great fit and a super great holster. Very nicely designed holster. I am using it with the paddle and it is comfortable and secure. I'll lbe ordering another. Exactly what I was looking for. Love the belt and paddle option together in one kit. Fits the g 42 nicely. Would recommend to others for sure. Just what I wanted: a secure OWB holster for carry under a jacket or heavy shirt. Fits the Shield 9 perfectly. This is a super holster and it is very easy to draw and holster after wards. Simple system but effective in retaining the off duty weapon. As our academy taught the draw with a more complicated locking system using the thumb while the position of the finger stayed to the side of the weapon side, prior to firing, it is super natural to have the weapon out faster then a thumb break holster. An awesome pice of equipment, can't be any happier. Excellent product, will buy again for my other hand guns. A great holster. I should've purchased it sooner. What can I say. Have. 2 others for glock17, springfield xds very small rig. But so is Smith j frame. These are all work rigs. Carried on my duty belt daily. Not all at once. J frame is so light it's perfect. When your on duty for 10 hours it sure makes a big difference. Oh it's old school gun with modern rig. But then again I am old school. Don't buy in to that deal about unintentional discharge. All Blackhawk holsters aid in proper master grip. No matter what gun you use. Right tool for right job. As long as your agency allows level 2 holsters. Took this to the range to qualify the day after I got it it is a very smooth release despite the excellent retention when not pushing the button. At this time, the P227 is NOT compatible with this SERPA holster. This holster is not design to fit weapon with light. Hey my name is Greg and I was just wandering if this will fit an xdm .45 with an 4.5 inch barrel. Thanks for your time. The SERPA will fit XDMs but with barrels less than 4" (compact and service models). Will this work with the G 30S? Select "Glock 30" as the fit. Will this holster fit a Taurus .45 acp 247 G2? Yes, it should fit the 247 G2. It says that it will fit a Taurus 247, will it fit the Taurus 247 G2 as well? The 247 fit should fit the G2 version.